(Aug. 15, 2011) Different grains have markedly different processing characteristics which determine to a large extent where processing takes place. Oats for example are light and bulky. 30% of the kernel is hull, essentially a waste product. Transportation economics makes it sensible to remove the hull and process the oats into the limited line of products. Oilseed crushing processes bulk canola seed into relatively low value meal and high value oil so processing near the production source makes sense. Malting barley also fits this model. Wheat and durum however are dense and easily shipped in bulk. Most of the kernel is used in processing and there can be over 40 different kinds of flour. Bakers and other flour customers will call for a variety of flour blends on short notice and they are likely located in highly urbanized areas. Pasta production has similar challenges. It converts the durum semolina to a wide variety of bulky, fragile pasta products, adds packaging and is best served by locating the processing and production in densely populated regions. There are 44 flour mills in Canada. Six of these can also mill durum. The capacity of these mills is 11000 of flour or 14500 t of wheat per day, a growth in capacity of 30% over the past 10 years. 32% of the milling capacity is located in Western Canada, mostly smaller mills. In comparison, the northern tier US states (ND, SD, MN, MT, ID, WA) have 16% of US milling capacity. Per capita wheat processing in Canada exceeds that of the US. There has been significant consolidation and concentration of ownership recently in the industry. ADM owns 39% of capacity, Horizon (primarily Cargill owned) has 18%, while Dover and P&H each have 12%. From 1990-2005 Canadian malting capacity increased by 50% while US capacity declined. 75% of malting capacity is located on the prairies and Canada malts 4 times more barley per capita than the US. Only one-third of our malt barley goes into making beer for the Canadian market because Canadians do not drink enough beer to take care of all of our barley production. About 25% goes to the United States and the rest goes to China, Japan, South Africa and other international markets. Through our sales agency, the Canadian Wheat Board, we supply about one-third of the world’s malting barley imports. 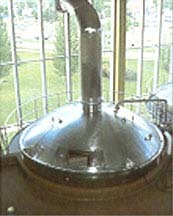 One of the largest malting plants in the world is located at Alix, Alberta. Good water, good rail, great barley and the CWB’s marketing and technical support make it possible. Farmers grow durum wheat not pasta. Pasta is a processed product that is expensive to transport. It makes more economic sense for farmers to ship their wheat to plants located closer to consumers. That is why most of the plants are in eastern Canada where most of the people are. The reality is that pasta plants are capital intensive world scale undertakings. Access to consumer markets and transportation costs for the end product to those markets is what really determines where the plants go. Not to mention that siteing decisions are made in the interests of the three big international companies, not Canada’s national interests or the interests of farmers. Even giving pasta plants free durum would not make them viable in remote, low population areas like the Canadian west. The effect of the declining American dollar against all other currencies has been the major push for pasta production within the US over the past five years or so. It also undermines Canadian pasta production. Farmers can of course sell directly to pasta or other processors, at CWB initial or pricing option price-plus a CWB Value added Incentive Payment (VIP) of about $3/t plus whatever trucking premiums or handling discounts they negotiate with the processor. If pasta plants are better off without the CWB one could only conclude it is because they could buy durum cheaper, which doesn’t benefit farmers. The CWB’s Domestic Human Consumption (DHC) pricing formula ensures processors access wheat or durum at prices that allow them to be competitive in North America so they are not disadvantaged by their location in sourcing grain. For farmer owned plants the CWB offers stock switching as well as the technical assistance available to other customers.